Foreword by Paul Duval, translated by Violeta Kelertas. TAV Publishing, Toronto, Canada. Copyright 1984, Aldona Valius. 144 pages. Hard cover. Double dust jacket. $40.00. The literature of Lithuanian art history has been enriched this year with the publication of Telesforas Valius. Visually a most attractive addition to the monographs already published about Lithuanian artists, this book is an honorable complement to the shelf of books on Canadian artists as well. The work of Telesforas Valius (1914-1977) has been described in earlier articles printed in Lituanus (Vol. 4 no. 2, June, 1958, and Vol. , 13, No. 1, Spring, 1967). After Valius's death, his widow Aldona undertook the task of memorializing him with this monograph. Valius's most illustrious graphic art student from the period when Lithuanian refugees worked together at the Freiburg Ėcole des Arts et Metiers in Germany (1947-49), Romas Viesulas accepted the responsibility of coordinating the book's production. 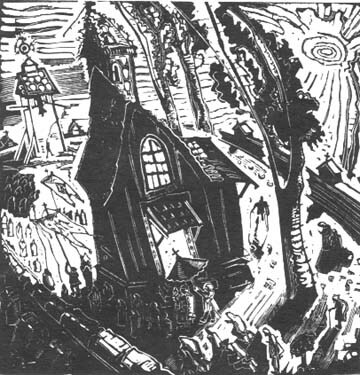 Viesulas, now a Professor of Printmaking at the Tyler School of Art at Temple University (Philadelphia, Pa.) and recipient of numerous awards and fellowships, has written a careful and objective study of Valius's work without the personal reminiscences one might expect in such a salute to a respected teacher. Only in his brief Preface, does Viesulas speak in the first person. He has produced a sound historical and technical work of scholarship. The text flows easily and explains the thematic, compositional and expressive qualities of Valius's work referring to 15 small illustrations within the body of the text and without the abrupt jumpiness that some art books display when relating to the plates. This smoothness is due in no small measure to the very capable and sympathetic translation of Viesulas's Lithuanian text into English by Violeta Kelertas, professor of Lithuanian at the University of Illinois at Chicago. It was a wise decision to pair the simultaneous bi-lingual discussions (on the left English, Lithuanian on the right) throughout the book, instead of separating the 2 texts, in spite of the difficulties this solution might have caused in the graphic design of the book. Above all, readers should be pleased that the book is in both languages, as this broadens its audience, while remaining true to the artist's spirit. Some monographs published in the West have been printed in English only. This use of the Lithuanian language might have been Valius's (and perhaps Viesulas's) gift to their homeland. Telesforas Valius. Easter Morning in Lithuania. 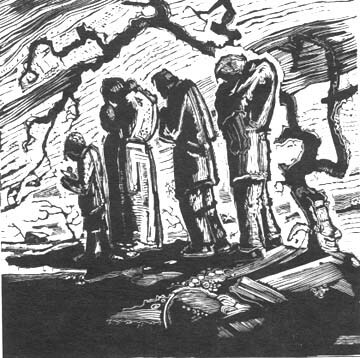 Wood engraving, 7939 (6" x 6"). Telesforas Valius. Famine. Wood engraving, 7940, (6" x (,"). The book begins with a Foreword written by prominent Canadian art historian and critic Paul Duval. 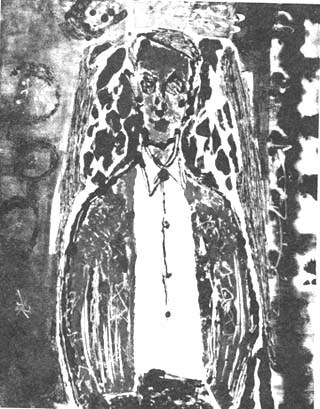 Running 5 pages (in each language), his discussion places Valius in the art environment of Canada and traces Valius's career path after his arrival in that country in 1949. Duval describes influences on Valius's work, his 9 trips to Paris between 1956 and 1977, and the development of his visual vocabulary and content. Duval also outlines Valius's involvement with his students, art societies and employment history. Duval evaluates Valius as an extraordinary artist, "a pioneer of Canadian graphic art", one who blended his artistic inheritance with the "fresh vitality and free spirit" he discovered upon moving to the West. Impressions of his native homeland of Lithuania, adopted country Canada and his spiritual home in France overlaid his tragic and solemn interpretation of life. Canadian artists appreciated his European high standards and great knowledge of graphic techniques and traditions. Canadians now sense the responsibility to honor his legacy. The book is organized in a very logical manner and reveals a full understanding of the artist's motives while providing a complete overview of his production. After Duval's Foreword, Viesulas's 46-page chapter "Valius and His Work" clearly summarizes the artistic environment in Lithuania in the 1920s and 1930s from which Valius evolved, then his personal and academic life. The chapter's sub-section "Valius' art" is a very well-considered piece. Since Viesulas himself is a master graphic artist, his technical analyses and descriptions are welcome complements to the intellectual discussion of the compositions. Thankfully, there are no excerpts from reviews, catalogs or articles in the body of the text to fragment the narrative, which in other monographs occasionally sound breathlessly laudatory. Viesulas respectfully elucidates the creative energies expressed in the prints and artist's psychology. The effect of emigration on his work is carefully presented. Valius suffered the trials and loss of his homeland in an all-encompassing way that aches in his most powerful black and white linoleum and woodcuts during the 1940s. Once settled in Canada and after his first trip to Paris in 1956, Valius stepped into color. „Possibly, the Canadian environment itself indirectly demanded attention to colour. The countries of North America by their mental outlook and social mobility traditionally display great optimism. So in a situation in which the surrounding demands for colour were great, there seemed to be no natural demand for the dramatic blackness and contrast of Valius' work. He seems to have realized that the black-and-white elements were losing their effectiveness." For the remaining 20 years of his career, Valius explored the compositional and technical possibilities of color in his work and simultaneously moved more deeply into abstraction. The Notes that follow the text are an important counterbalance to the primary text because of this section's concentration on anecdote, published references, technical details on individual prints, and specifics on the many Paris sojourns. The 55 plates of black and white and color reproductions are clear and sharp. An 8-man consulting committee helped to select this representative array of artworks that will be a revealing collection to those readers unfamiliar with Valius's color work. All colored pictures are reproduced in color; we are spared the diminishment of impact that black and white reproductions of colored artworks provide. The plates are of basically two sizes, and are arranged chronologically within media categories: wood engravings, linoleum cuts, monotypes, lithographs, colour drawings, pastel drawings, drawings and etchings. On each page, the city where the print was produced adds a helpful bit of information. There are surprises here for everyone. For example, probably few people realize that Valius also completed several sculptures. After the plates are lists of works in public collections, awards, books illustrated or designed by the artist, articles by the artist, exhibitions, bibliography, and chronology. These lists are well-documented and add significant information to the text. The only negative point about the book is the omission of a photograph of the artist. Photographs of Valius's mother and father are prominently featured in the biography section. We are told that Valius was a very private and modest person, but surely a photograph of him must exist. The color monotype Self-Portrait (Plate 15) and the small photograph of him working at a printing press that closes the text are immediately noticed by most readers as inadequate images for this impressive monograph. The book's design is a pleasure to experience. Heavy beige-toned paper, large type in an attractive type style and the visual framing of each page make the book easy to read and hold. The color reproduction on the dust jacket is protected by a clear plastic cover and is appealing in appearance. The book was designed by Hugh Michaelson Ltd., and produced in Canada. Telesforas Valius is a fitting tribute to his talent and is a handsome addition to any library of art books.